It’s Spring Break and thankfully, at least one of our kiddos is sleeping in! I usually save the big breakfasts for the weekend, but it’s a rainy day today…so why not? Whisk together the flour, powder, soda, salt, and sugar. In a separate bowl, combine the buttermilk, eggs, vanilla, and butter. Gently fold the wet ingredients into the dry. 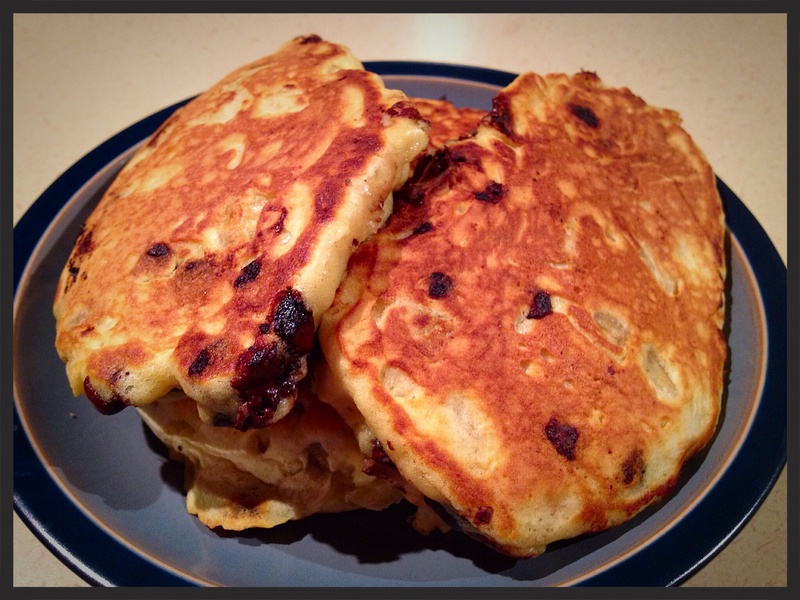 Fold in the bananas, chocolate chips, and pecans. Pour the batter onto the griddle. (I use a 1/4 C. measuring cup per each cake). Cook until the sides are slightly browned and the pancake starts to form little bubbles on the top. Flip and cook until browned. Serve warm with butter and syrup, or for a little extra kick add chocolate syrup. I really liked this recipe because there were chunks of banana and they were quite fluffy 😃 The kidlets gobbled these goodies up pretty quickly!